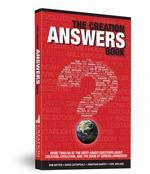 Subscribe to Creation magazine for 36 months and receive a Free copy of 'The Creation Answers' Book! Offer expires 30.06.2019 or while stocks last. Free Gift applies to 36 month subscriptions only. Available to AUS residents only. Gift is sent to the purchaser. CREATION MAGAZINE: The World’s Most Widely-Read Creation Publication! Creation Magazine presents the wonders of science and nature in 56 colorfully illustrated glossy pages. A Christian magazine, it’s suitable for ages 9 to 90! This unique family magazine deals with the big issues of our time like evolution, intelligent design and creation. Creation Magazine explores how ideas like ‘Where did I come from?’ and ‘Why am I here?’ affect individuals, families and communities.Articles are checked by experts but written in an easy to read style. Keep up to date with the latest news about astronomy, fossils, biology, geology, archaeology, dinosaurs, geography, radioactive dating and more. Each issue includes a children's section. No paid advertising gets in the way.A common comment received is: “When Creation magazine arrives at our place, there’s a big scramble for who will get it first. Whoever does usually locks themselves away till they’ve read it cover to cover.“You have given me a wonderful tool with which to teach my children the truth of creation.”Kathie I. A real eye opener! I read it from cover to cover! An excellent resource.